Reverse Mortgage Funding on Monday will join the proprietary reverse mortgage loan market, announcing the Equity Edge Reverse Mortgage for borrowers aged 60 and up. The new product, which will officially become available to borrowers June 1, is specifically targeted at homeowners with properties valued at $700,000 or more — as well as those with non-Federal Housing Administration-approved condos. The goal, according to RMF president David Peskin, is to help fill several voids created when the Department of Housing and Urban Development lowered principal limit factors and changed the mortgage insurance premium structure last fall. Before that decision, RMF identified competition with the home equity line of credit option as a major area of growth, given the Home Equity Conversion Mortgage’s relatively lower upfront costs. But the October 2 changes hamstrung that opportunity, Peskin said, and RMF accelerated plans to tap into the jumbo reverse mortgage market. “We were always going to introduce our own proprietary product, but it kind of had us shift gears a little bit faster than we thought we would,” Peskin told RMD. In particular, those changes hurt higher-value homeowners who might not be interested in tapping the full value of their homes, Peskin said. He gave the example of a California homeowner with a house worth $800,000: In order to access $200,000 of that value with a Home Equity Conversion Mortgage, the owner might end up paying $16,000 to $18,000 in fees, including mortgage insurance premiums. The Equity Edge loan, meanwhile, doesn’t come with an upfront origination fee or any mortgage insurance premiums, with borrowers on the hook for title and appraisal costs of around $4,000, Peskin said. Offering the product to borrowers aged 60 and older — as opposed to the 62-and-older restriction in the federally backed HECM program — was an attempt to break into the growing 55-and-over housing marketplace. “You also have people thinking about retirement and planning for that at an earlier stage, whether it be through financial advisors or themselves, and why not start the process as soon as you can?” Peskin said. RMF joins Finance of America Reverse in the jumbo loan market; FAR last year introduced several upgrades to its HomeSafe product, including a lower interest rate and a higher principal limit, and also partnered with American Advisors Group to begin offering the proprietary loan through AAG’s correspondent channel. 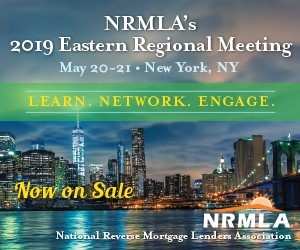 The Bloomfield, N.J.-based RMF will begin offering the products on a retail basis to borrowers in California, Florida, New Jersey, Oregon, and Virginia — states specifically selected due to their higher-than-average home values, Peskin said. Third-party originator access will begin July 1, and RMF has a goal of adding five to eight states per quarter going forward. In addition to condo dwellers and those with high-valued homes, RMF will also target borrowers who need to pay off existing debts in order to qualify for a traditional reverse mortgage, or who might be considering a refinance into a fixed-rate mortgage.